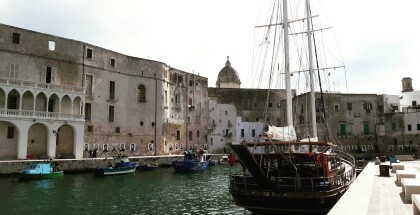 After the first day an appetite for further exploring of Puglia grew. 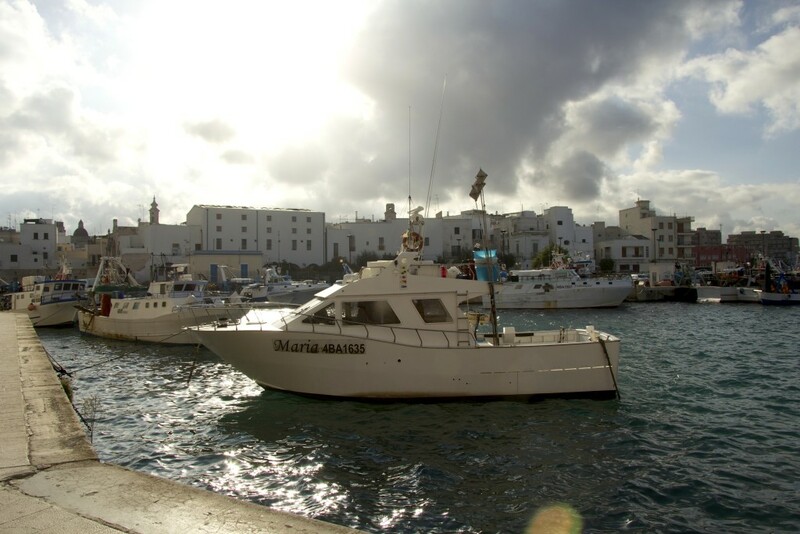 The plan is to: return to Monopoli for lunch, later watch trulii houses in Alberobello, and at the end for dinner we go to the Ostuni, town located on the hill. The day started very peacefully in our B&B le 3 Sorelle – coffee, Bologna sausage homemade jams and local cheese. 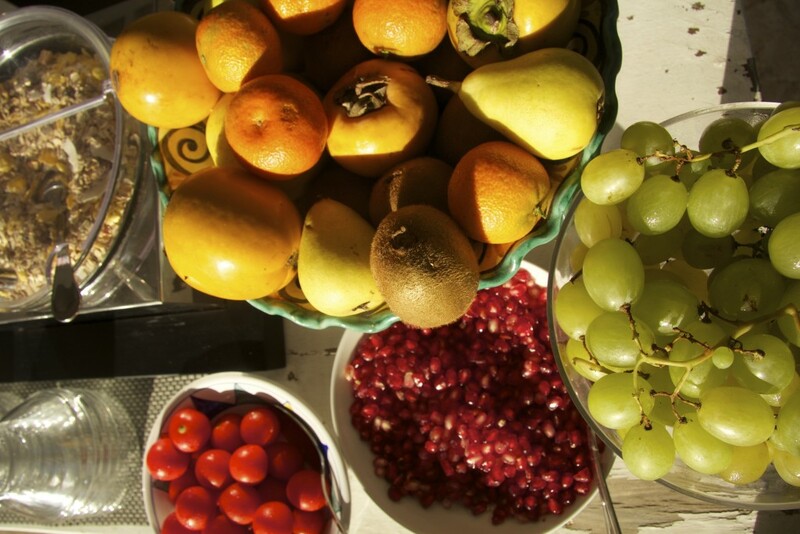 The Italian breakfast was never my favourite, but aromatic coffee, yogurt with pieces of peaches and cereals served in the garden underneath Orange tree taste the best in the world. After 11 a.m. we clamly in to the Monopoli direction- two-lane road pased quickly, and after a bit more than half an hour we are in town. 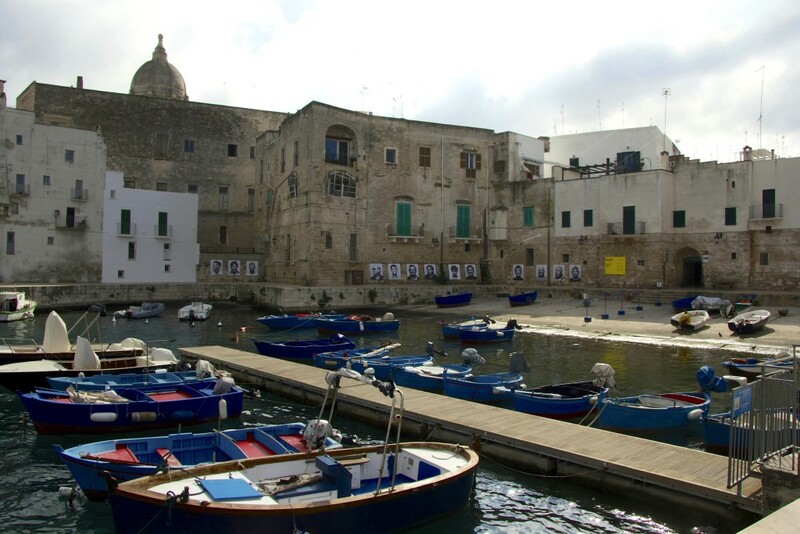 monopoli is a town created from water, with coastline stretching for 15 kilometers, with beautiful cliffs lovely old port, where we will feel the true spirit of the town. You can also see its beauty in castle and palace Martinelli from XIII century, where you can admire eight neo-gothic arcades. 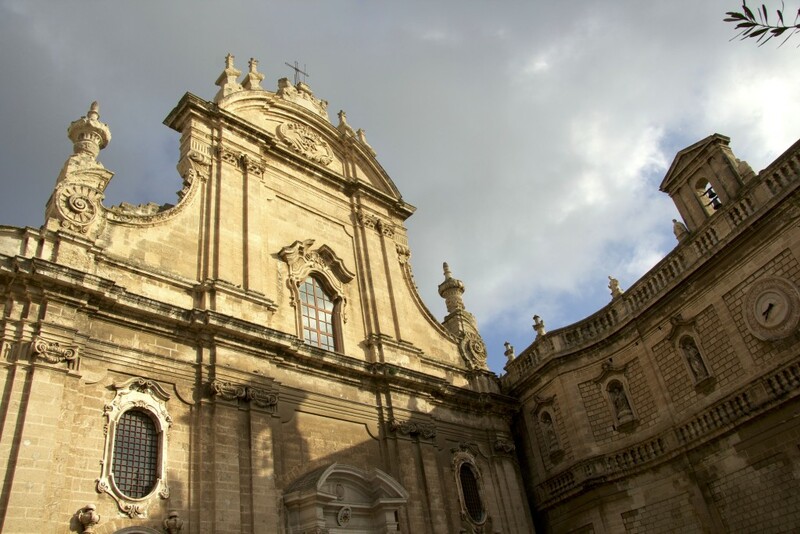 The biggest tourist attraction is the Basilica Cattedrale Maria Santissima della Madia – wealthy and elaborately decorated temple, which interior for many is good enough reason to visit Monopoli. 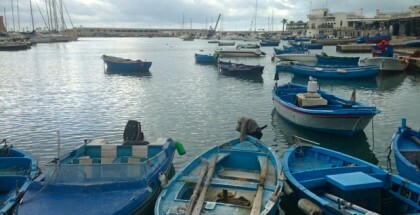 We decided to check tastes in this fishing village and we headed to already recommended on intopassion.com Osteria Perricci. Family tavern with pictures, tablecloths made out of oilcloth and as we assume from the greatings – local people who come here for food. It’s a good sign – we think. 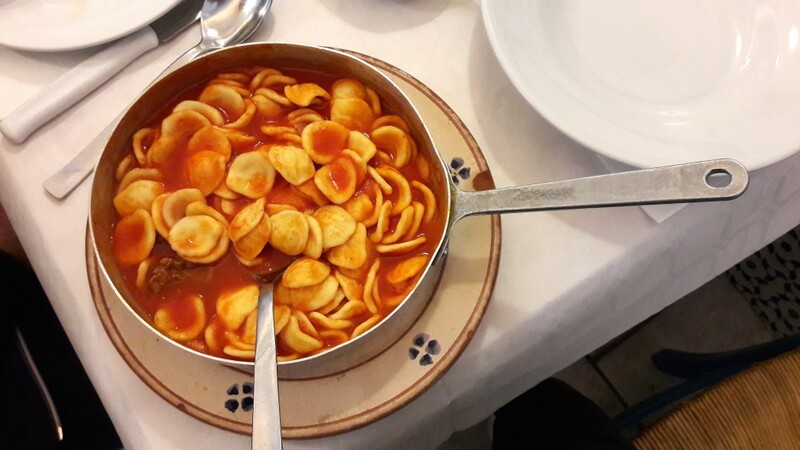 Maciek decided to try out popular local specialty orechiette in tomato sauce with meat. This is some kind of small ravioli, which are often made on the streets of towns and sold to local people and tourists. But we didn’t came here for Italian primi piatti, but for fresh fish and seafood. Maciek starts from shrimp, which are perfectly soft and fresh, I start from whole delicious fish. For second round we order one more serving of shrimp and mule without pasta. 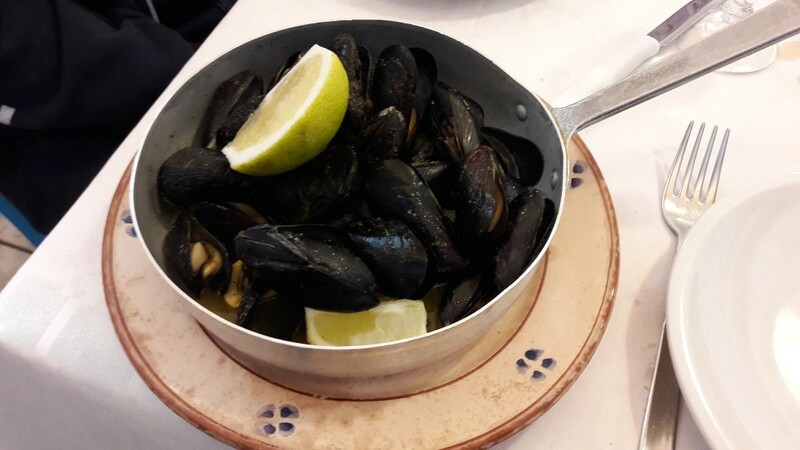 We can’t really come to understanding on what we want but all Italians from the neighboring tables are helping us – and we succeed – we are getting a bowl of fresh, mouth-watering mules with sauce with lots of pepper. Excellent meal! When 3 p.m. is approaching tourists appear in the doorway owner warns them that they can only gat pasta at the end of the day, but they don’t mind. We leave the place and move to the Italian bar – I have a coffee and Maciek ice cream. La Dolce Vita! 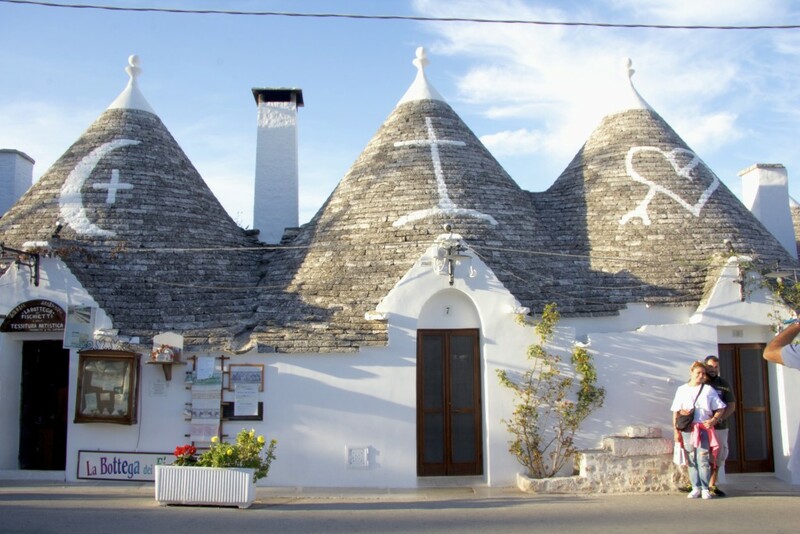 After all of these culinary delights we are ready to move on – to the main point of our trip – a tourists town with trulli houses – Alberobello. Due to the large number of tourists who take pictures in front of every second cottage, it’s the best to go there out of season (like us!). A short walk alongside the circular stone houses with a conical roof. Trulli was inscribed on the UNESCO list. After a short walk it’s worth to stop by the small shop down below – You can buy many interesting things, such as piranhas made for hanging or placing, painted toy car and soldiers made out of metal, ornaments hanging with colorful shells. In the past trulli were farmers houses, in which they stored tools, animals where sleeping, and woman sometimes, when men set off for the harvest. 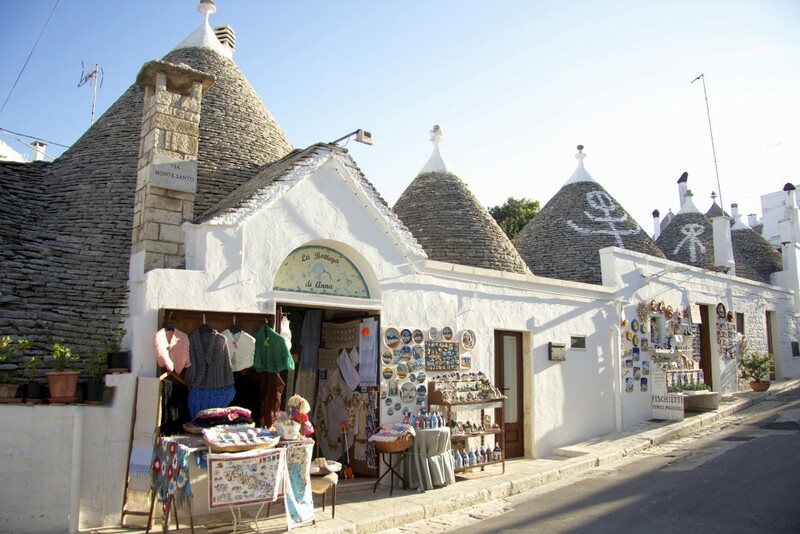 Today in entire town and its surroundings we can see trulli houses as sheds or utility rooms. We both agree that Alberobello is worth seeing, but short walk is enough. We go to the car and quickly decide to move on to Ostuni for dinner. Called the White City, proudly located on the hill – we stopped to take pictures, but unfortunately we failed becuase it was twilight. 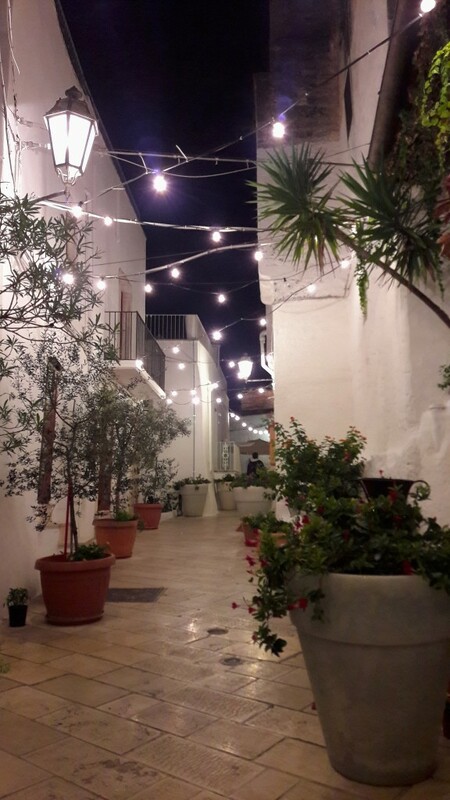 Ostuni give the impression of ancient colony – all of the houses are whitewashed, the old town is surrounded by walls, and on top of the hill is the cathedral. No doubt attraction for visitors is castle Zevallos and the Church of San Francesco d’Assisi. Walking though the narrow streets, among white houses, reminded me of the charm of the Greek Islands. After 7 p.m. we moved in the direction of Teverna della Gelosia – place recommended by owner of our B&B from Bari. Tavern is located “patio like” on hill – we can choose from the tables outside and inside. The atmosphere is great and menu – supposedly delicious. For an appetizer I take a plate of local food, while Maciek take black rice with shrimp with primi piati. My snacks are great! Surprising flavors are difficult to recognize, but most of them are specially prepared vegetables in the form of pastes or fried balls, there is a sausage with mushrooms and mozzarella as well. 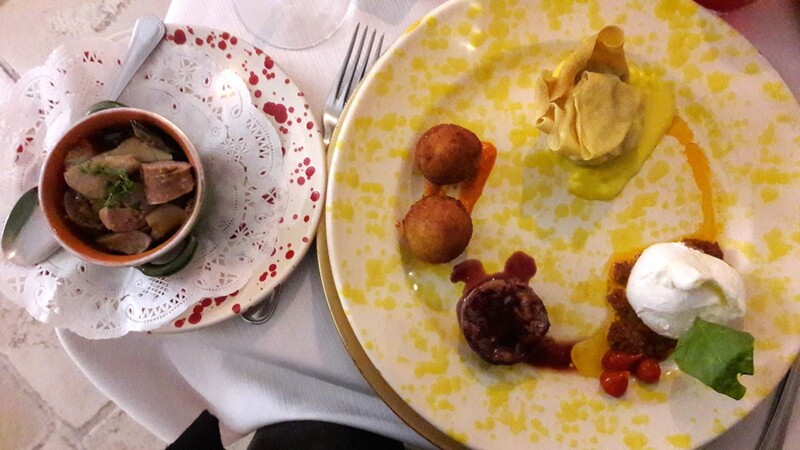 The restaurant specializes in meat dishes – the biggest surprise for us is pork hock that Maciek gets (after translating waiter from Italian we expected a pork cutlet) – all in delicate sauce made with honey and fresh herbs. In summary – great culinary experience, but for both of us could end on appetizers. We are simply not big fans of meat. 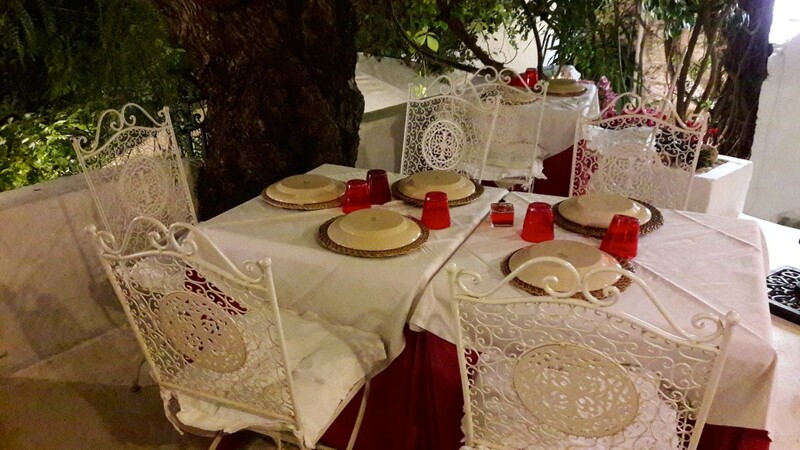 It is 9 p.m. (for southern Italy in this moment many guests arrive for dinner). We are coming back to the car and heading to ours apartaments in Bari. Once we are arrving, there is nothing else to say to ourself Buena Notte, because tomorrow is waiting for us another – our the last day! This post had me drooling! I’m afraid if I go to Italy I’ll have to buy new pants now…I am officially adding “Stay in a B&B and eat locally in Puglia” to my bucket list now!